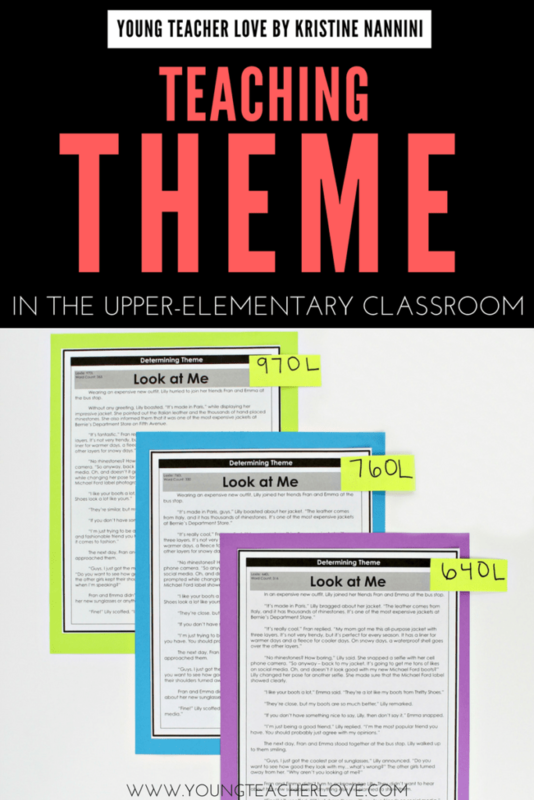 Okay, everyone, I want to discuss theme to help you teach it in your classroom. In the upper grades, your students are no longer reading fables with clearly stated morals or lessons. Your students must read a fiction story and determine a theme (message or lesson), which is not explicitly stated. 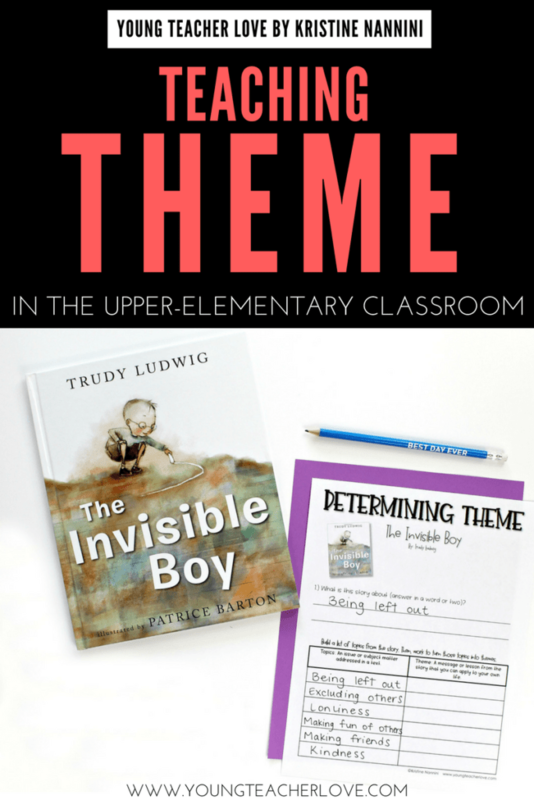 In this post, I will share a step-by-step process to teach theme in the upper grades, and I will also provide you with anchor charts, printable posters, and mentor texts to help your students determine theme. Before I get into my post, I must include a caveat. Definition #1: Theme is a single word that explains what a story is about (e.g., love, friendship, jealousy, etc.). Definition #2: Theme is a lesson or message from the story that students can apply to their own life (e.g., Honesty is the best policy, It hurts when you exclude others, etc.). I’m not here to debtate or decide which definition is right or wrong. Instead, I will share my research with you, explain why I teach definition #2, and provide some tools to help you make an informed decision for your students. I have seen professional and academic texts call definition #1 several things, including a topic, a thematic concept, a motif, the genre, and even the subject of the story.¹ The same professional and academic texts often refer to definition #2 as a work’s thematic statement, or simply, it’s theme. Definition #1 is not technically wrong, but it’s not the definition I teach. I teach definition #2 for two main reasons. First, after some extensive research, it’s the definition adopted by the standards in many states. For some of my research, I went through the glossary of terms of quite of a few state’s standards, which I have highlighted for you in the image below. 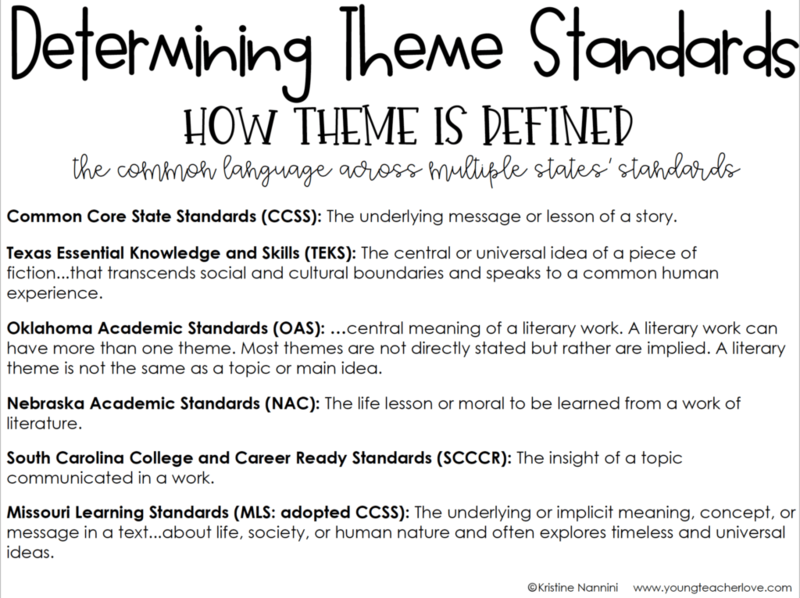 I also teach this definition of theme because it requires students to perform higher-level thinking and engage in a deeper level of reading comprehension instead of just telling me common topics of a story. With that caveat, below are the steps I use to teach theme to students. 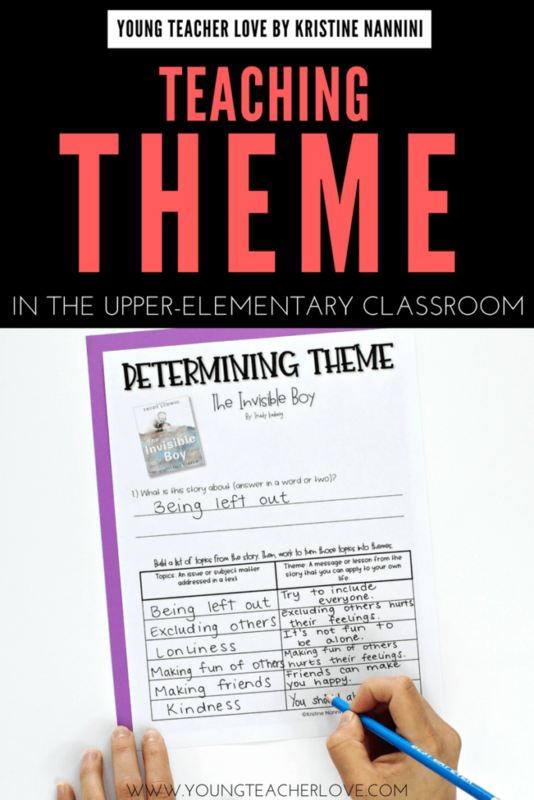 Students need to know what theme is before they can reliably find it in a text. So you need to define it for students in a language that they can understand. I teach my students that theme is the message or lesson from the story that you can apply to your own life. It’s the lesson or message the author wants you to learn from the story. The author won’t explicitly state it – you often have to infer the theme. There can be more than one theme. It’s not specific to the story you’re reading. The theme of a story is universal. It applies to everyone. You can use these big ideas to work with your students to create an anchor chart together. Below is an example of an anchor chart that you can create with your students. I’ve also created this anchor chart (and every other anchor chart below) in a printable version so that you can use it in your classroom with your students to help guide your teaching. Just click HERE to grab this free printable anchor chart. In addition to going over the definition with students, you can see that I also touched on a great mentor text. You can read more about how we used this mentor text below. It’s important to not get confused by competing definitions or inaccurate resources. In addition to the example above from The Invisible Boy, single words like jealousy, persistance, and love are also NOT themes because there is no message. Those single words are probably better described as subjects or topics of stories. You can read more about this below. “You can achieve your goals with hard work” or “love has the power to change your life”…now those are some themes on which you can build a story! Also, don’t confuse theme with story genres, patterns of events, or conflicts. Coming of age (pattern of events) and good vs. evil (conflict) are not themes because they say nothing about life or the human condition, and there is no message. 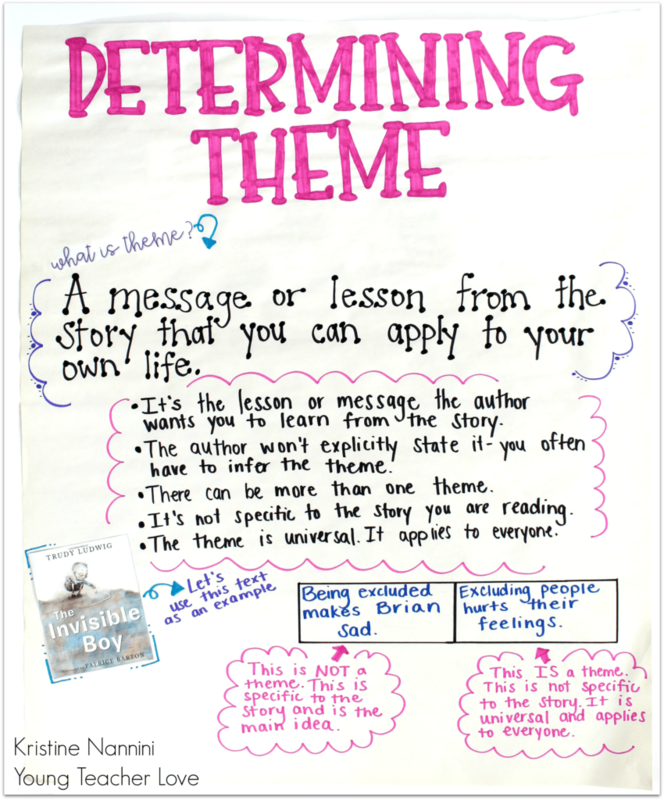 Once we define theme as a class, I then use a mentor text to introduce the concept. 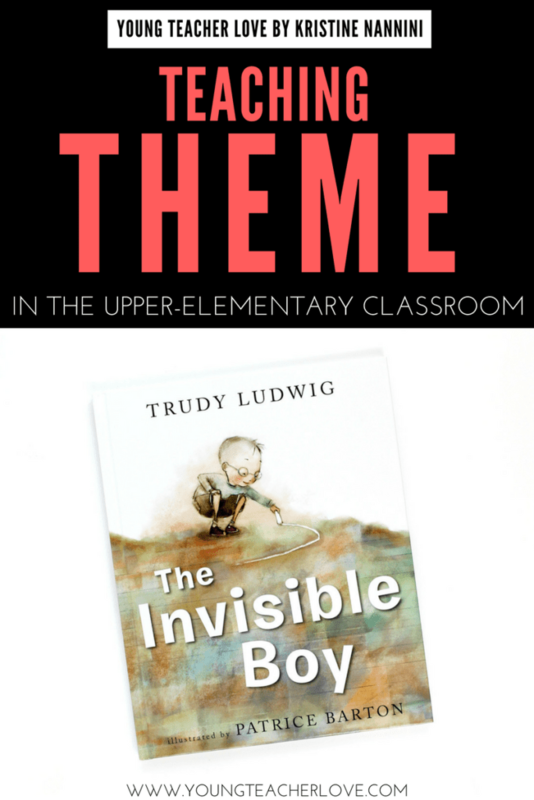 I read The Invisible Boy by Trudy Ludwig. 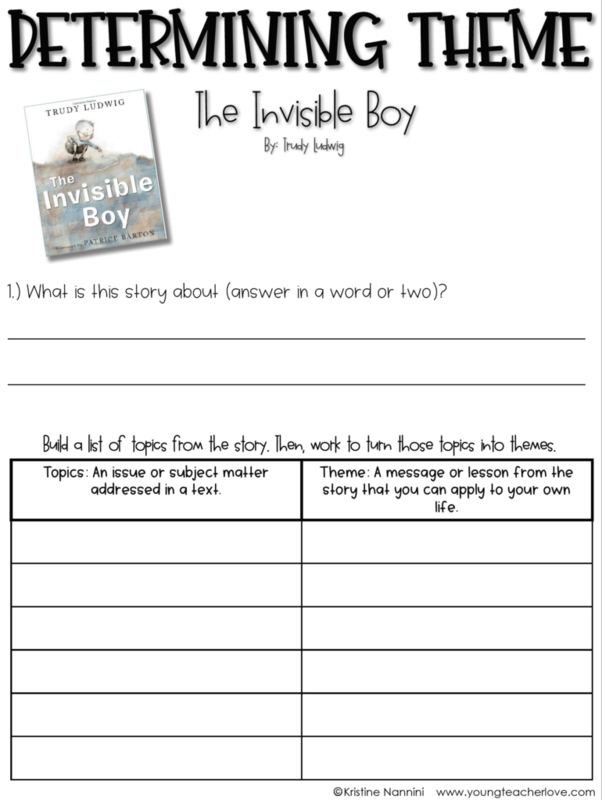 The Invisible Boy is a great book to teach theme because students can easily relate to its message and apply it to their own lives. 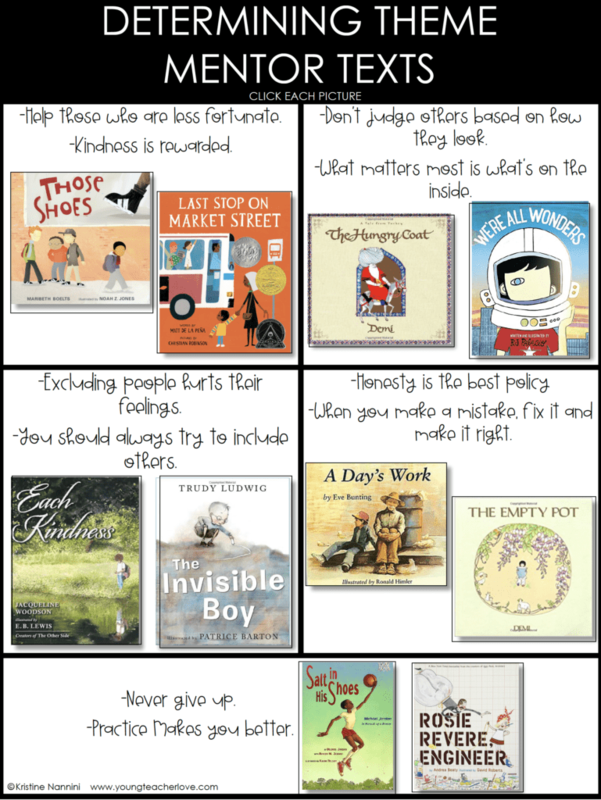 In addition to The Invisible Boy, below is a list of many other mentor texts you can use with your students. 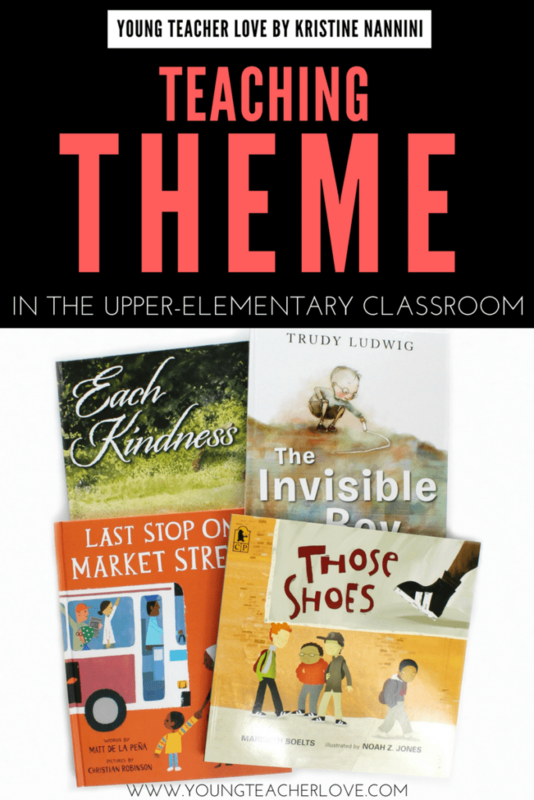 Click HERE to download the free list of Theme Mentor Texts below. You can then click each picture to be directed to the book to check it out for yourself. 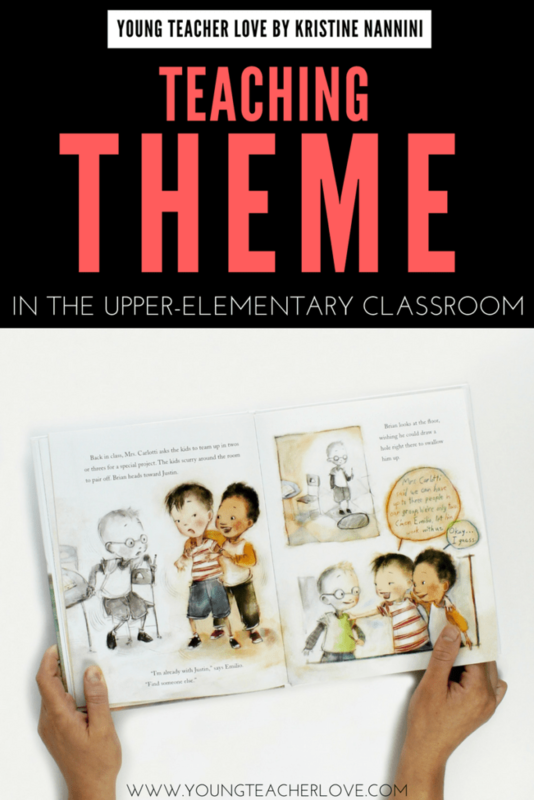 Now that students have a solid understanding of what theme is, and they have had the chance to be exposed to a great mentor text, begin the active engagement portion of your lesson by finding topics of the story. Topics are the subject matter addressed in the story. They are typically one word and will tell students what a story is mostly about in a word or two. 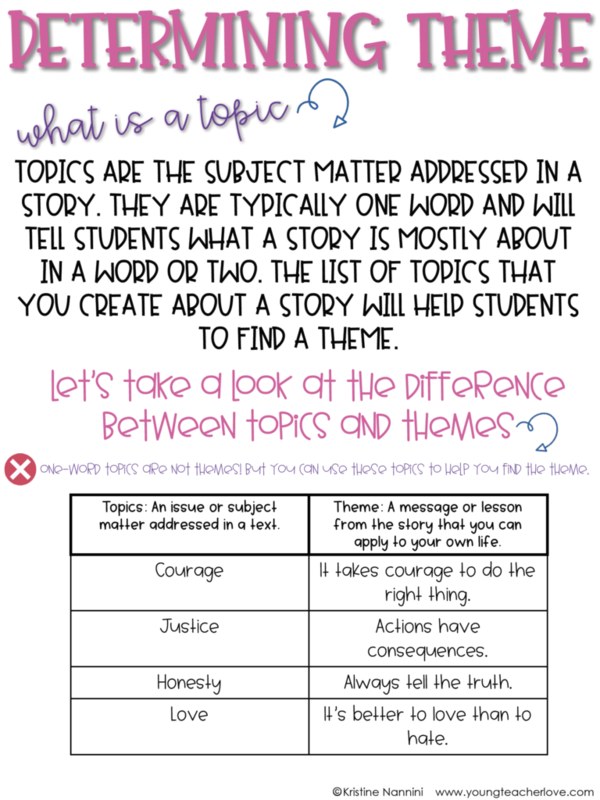 The list of topics that you create will help guide your students to find a theme. The theme of a story will be the message or lesson the author wants the reader to understand about that topic. To help students build this list of topics, start a discussion about the mentor text. Talk to students about the main character, what the main character went through, how the main character responded to the problem, etc. 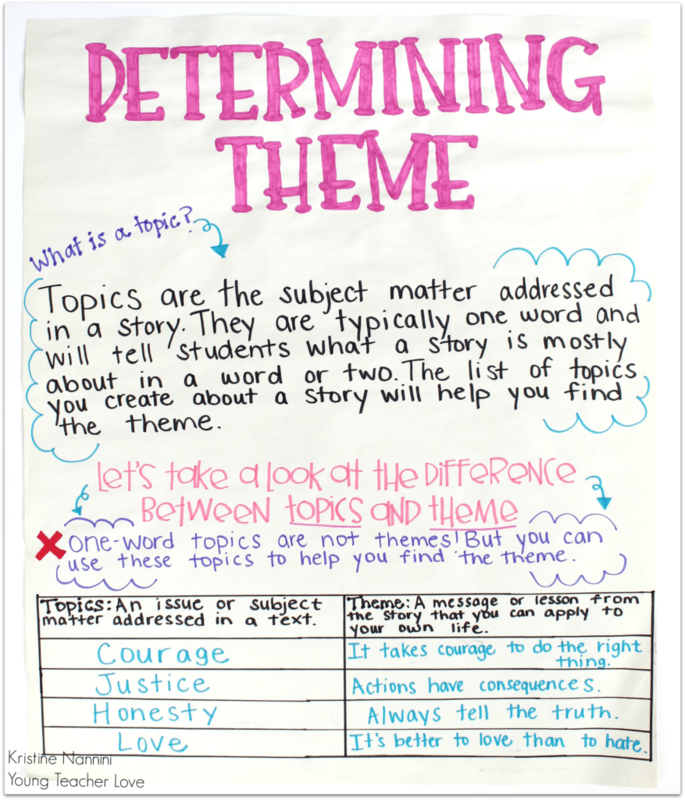 At this point, you can create an anchor chart with students to highlight the difference between topic and theme. 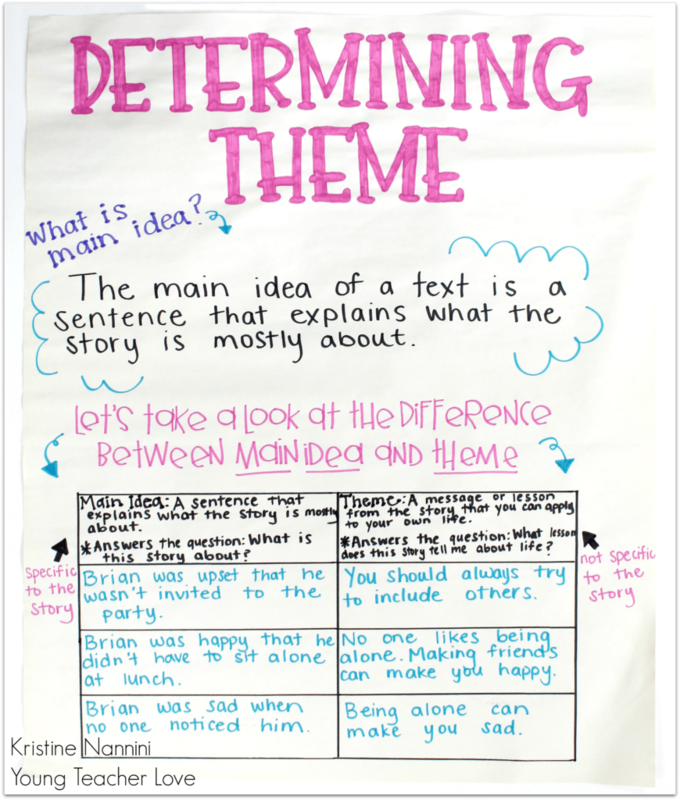 Below is an example of an anchor chart that you can create with your students. I have also created this FREE printable that you can give to your students while they are gathered on the carpet. 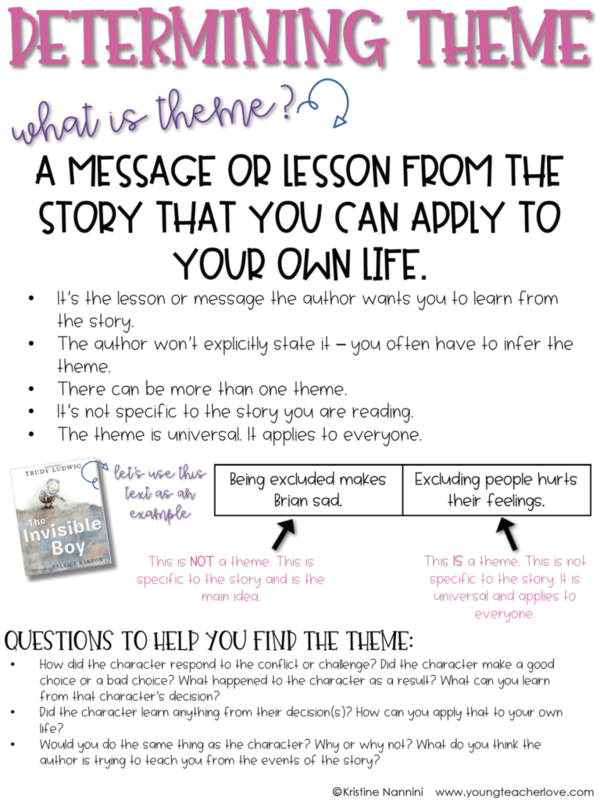 This printable will help students to identify the different topics in the story. Click HERE to download the free printable. Remember, at this point, make sure your students understand that these words and phrases are not themes because there is no message or lesson yet. Work with your students to create a list of responses. Keep going until you have a number of good topics. Now that you and your students have come up with appropriate topics from your mentor text, you can use these topics to find themes. Pick one topic and start a discussion about it. For example, ask students: “What is the story trying to teaching you (not Brian’s classmates) about exluding others?” Allow students some think time, and then ask students to answer this question. By answering this question, they are coming up with themes. Then, continue these questions about each of the topics. As your conversation continues, you can tell students that they are finding themes by thinking about the message or lesson the story is teaching them about each of these topics. Sometimes, students still might give responses that are specific to the story, such as: “Brian’s classmates shouldn’t have excluded him from the party.” These responses are the main idea because they tell you what the story is mostly about instead of the message or lesson the story is trying to teach you. If your students are still struggling to think big picture, you can take the text-specific short summaries (main ideas) that they give you and turn them into themes (universal) so that they can see the difference between the two concepts. 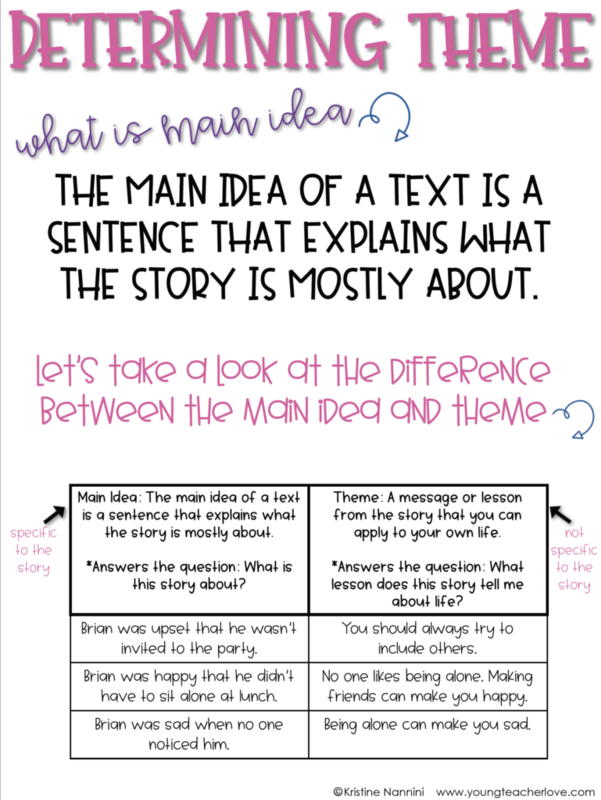 Below is an example of an anchor chart that you can create with your students to highlight the difference between main ideas and theme. If your students are still struggling, below is a list of additional questions to help students reflect on the story and focus on the message. You can also find these questions on the above free Determining Theme Printable Anchor Chart found HERE. How did the character respond to the conflict or challenge? Did the character make a good choice or a bad choice? What happened to the character as a result? What can you learn from that character’s decision? Did the character learn anything from their decision(s)? How can you apply that to your own life? Would you do the same thing as the character? Why or why not? What do you think the author is trying to teach you from the events of the story? These questions are also great for your students who need additional interventions. When you pull your small groups, use these questions to help guide your discussions. The last step in the lesson is to allow students the opportunity to practice with their self-selected books. 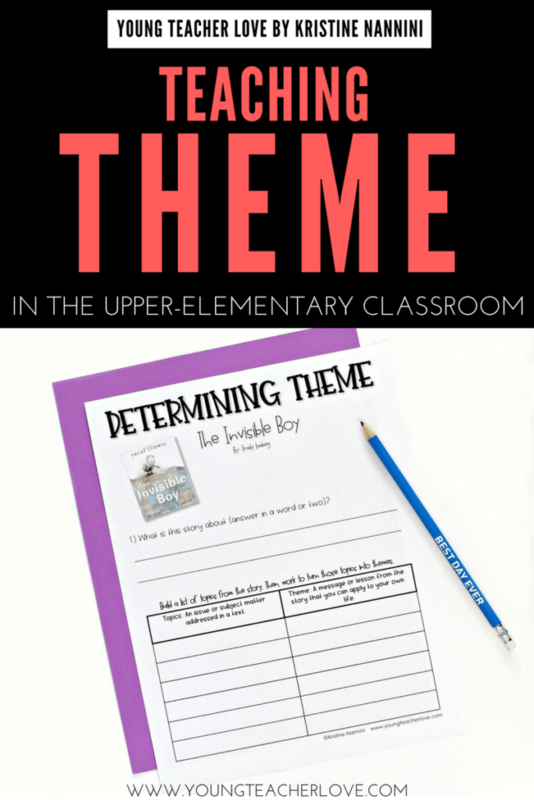 If necessary, provide each student with a set of printable discussion questions and printable anchor charts to help them determine the theme. In addition, use this time to conference with students to make sure they truly understand what theme is. 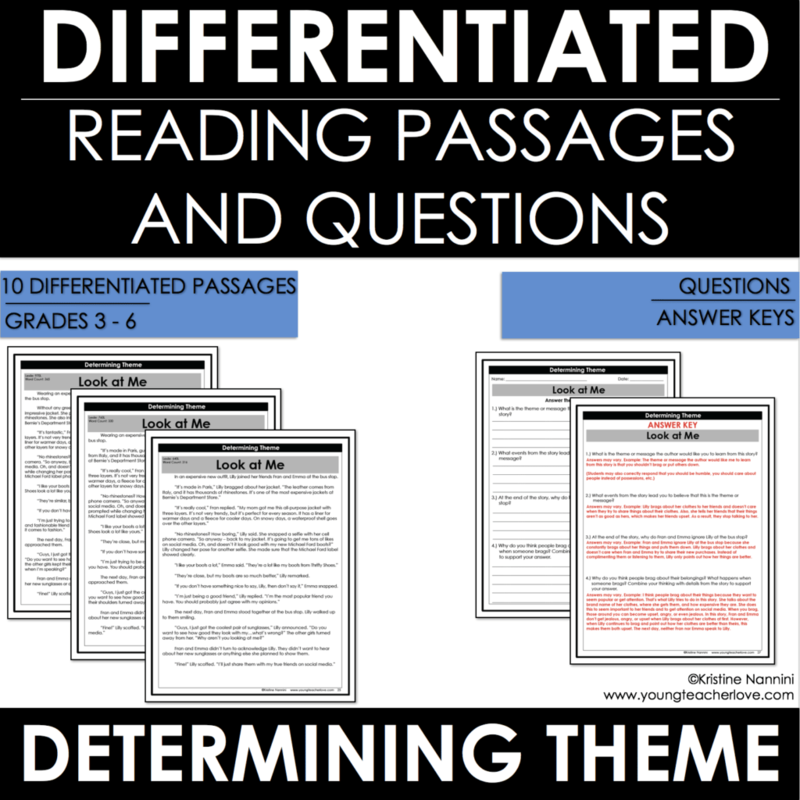 Since it may be tough to get a great mentor text for each one of your students in your small groups, you can use my Determining Theme: Differentiated Reading Passages and Questions. 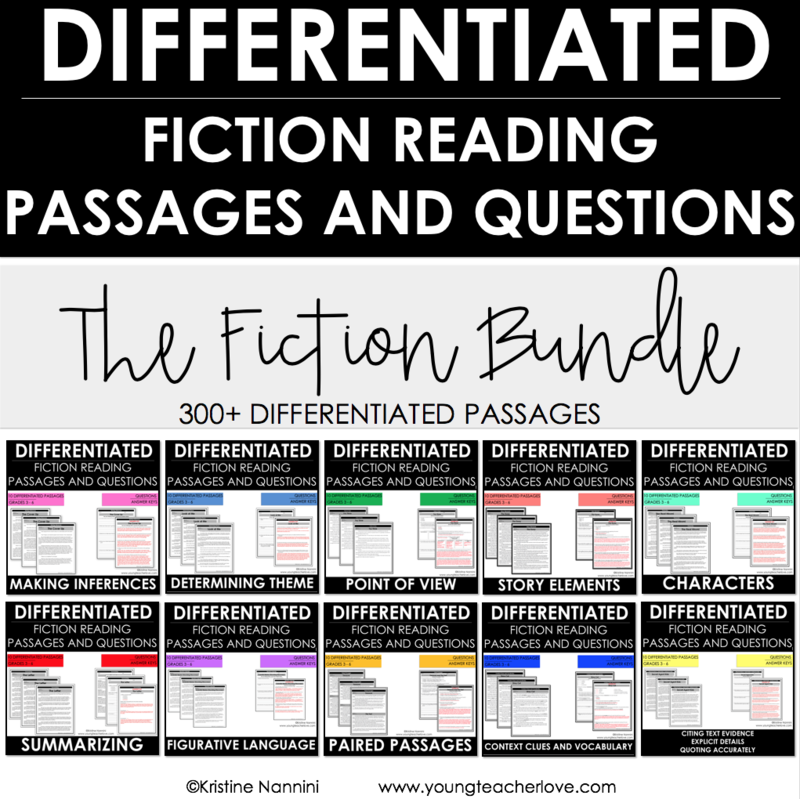 These are a great resource to use when practicing theme with your students because the passages are already leveled and differentiated for your students. They can comprehend the text at their level. 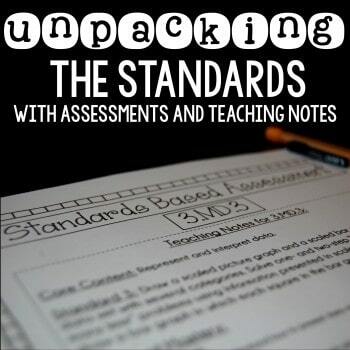 This resource is now included in a large bundle with over 300 differentiated passages. Click HERE or the button below to check it out! 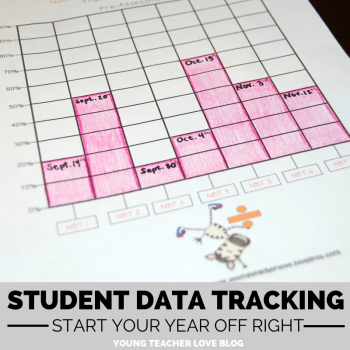 You can also grab the free printable anchor charts and free Determining Theme printables by clicking HERE. ¹ Griffith, Kelley (2010), Writing Essays about Literature (8 ed. ), Cengage Learning, p.40. My peers and I went round and round about this confusing term. We finally settled on 2 slightly different terms: thematic concept, and thematic statement So far it’s working. I love your 2-column organizer! It could lend itself to our terms and help our kids (8th grade) see how one feeds into the other! 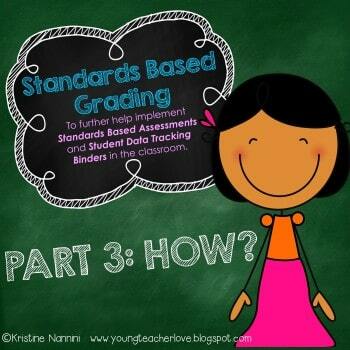 Thank you for sharing such great resources,, consistently! This is fabulous. Thanks so much! However, none of the links worked for me. When I clicked on them, the screen was just blank. Is it just me? 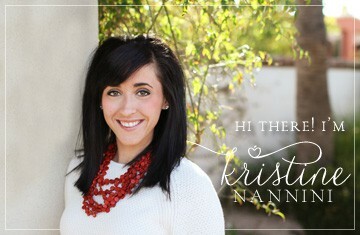 Thank you so much for your kind comments, Kristina! I just checked all the links, and they are working. Try using a different browser (Mozilla, Chrome, Safari, etc.). A few people have told me this has worked for them. HI! I love this — thanks for the freebie! I have a question: the CCCS doesn’t seem to use the term “main idea” for the literature standards. I have heard people make the analogy that theme:literature :: main idea:informational text. Your thoughts? Hi Nova- I agree with this!